This year, we’re putting the power in your hands to group yourself with the people that you’d like to sit with. Seating Community Groups give you and your friends the opportunity to experience Conference from all over the auditorium, helping you to relax when it comes to knowing where to sit for each session. Select the Find You Order button above and locate your registration. Once you’ve found it, select Manage, then Start a New Group. Give your group a fun name! Once you’ve submitted the form, you will receive an email confirming your group has been created. This email contains your Group Name, a passcode and a unique group link. Forward that email to all the people you’d like to join your group. They will then have everything they need to join! Select the Find You Order button above and locate your registration. 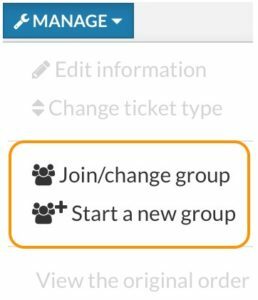 Once you’ve found it, select Manage then Join / Change Group. Find your Group Name in the search for an existing group field. (If you do not know the name of your group, get in touch with your group leader). Once you have found your Group in the list, select it and then enter your Join Passcode and click Save. If you don’t have your Join Passcode, contact your group leader. Once you’ve done this, your Group Leader will receive an email letting them know you’ve been added to their group! You’re done! You’ll need to be an existing delegate of Hillsong Conference London 2018 in order to use Seating Community Groups. As part of the registration process you’ll be able to create a new group or join an existing group.